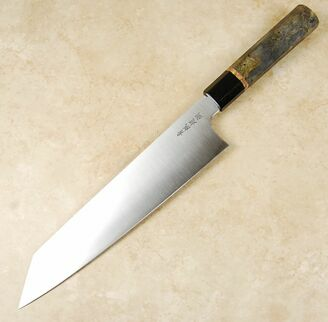 Aogami Super is regarded as one of the best steels to use for the manufacture of kitchen knives. It is a steel that can be taken to very high hardness levels, resulting in a blade that is durable and has great cutting abilities and edge retention. It is a more difficult steel to work than many of the more common high carbon varieties, so blacksmiths are pushed to higher levels of perfection and technique to get the best out of it. 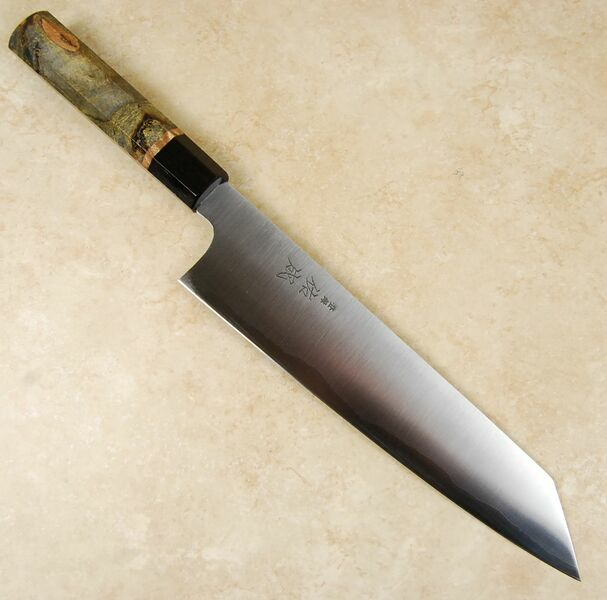 Sukenari are very well known for their forging of exotic steels including honyaki type blades. The AS Hairline series certainly reinforces that reputation. The inner core of AS is hardened to about 64 HRC. 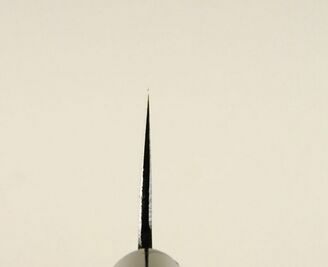 It is clad with a softer stainless steel layer which adds strength and reduces maintenance. The edge is still very reactive and does require care with washing and drying between uses. 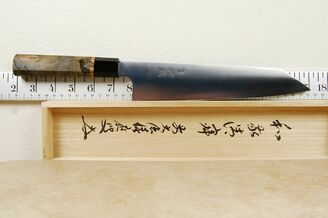 This 240mm kiritsuke is a double-beveled and symmetrically ground knife, so it is sometimes referred to as a kiritsuke gyuto. This design is easier to use and sharpen than the traditional single bevel kiritsuke. It also allows for an ambidextrous personality of the knife. The pattern is excellent for push-and pull-cutting and the flatter edge also makes it a very workable slicer. The Sukenari AS Hairline kiritsuke is supplied with a very well made octagonal custom by Isaiah Schroeder. Please note you're purchasing the custom knife in the photo not the regular one in the video below.